For more than 60 years, residents of Rockford and northern Illinois knew the biggest industrial building on South Main Street only as the headquarters of a cabinet hardware company of worldwide prominence. Today, scarcely anyone still living is old enough to remember its original use, and its influence in a robust industry during the city’s formative days. Now, via extensive research we are able to tell, quite literally, “the rest of the story”! William Ziock, Sr., for whom the building was originally named, and William Ziock, Jr., the son who initiated construction of the building, clearly were enthusiastic entrepreneurs and successful businessmen. They were early prominent figures in the knitting, hosiery and textile industry. Unlike some of their peers, they provided for the welfare, health and safety of their workers. Their concern translated to improved working conditions in a state-of-the-art building, the tallest of its day in Rockford. Newspaper accounts describe upper floors that include a kitchen and a dining room, all with panoramic views. The Ziocks generously invited a variety of organizations to use these facilities for banquets, benefits and special events. And they served as benefactors to the greater community. 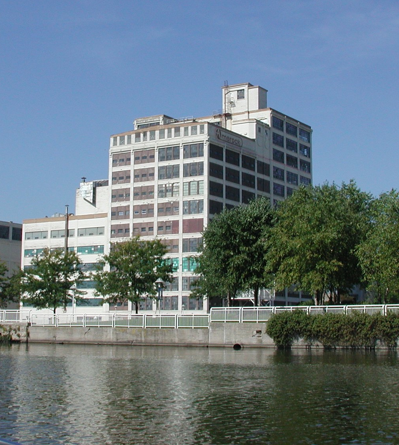 With the original (northeast portion) of the Ziock-Amerock Building now 102 years old, it is a monolithic emblem to the industrial might of Rockford, Illinois and a tangible reminder of the charitable largesse of the founding family. Latest, dramatic drone video taken December 20, 2017 as construction of the Embassy Suites Hotel and Conference Center is starting. Video (50 seconds courtesy Apollo Aerial Imaging and Engine Studio). You can see workers and equipment entering the building. Take an earlier close-up aerial tour here Video (2-1/2 Minutes).